Some years ago I had the opportunity to evaluate a large number of properties located throughout parts of Kansas, Missouri, and Oklahoma. One of the areas was Tulsa, OK, which is home to the Quik Trip Corporation. Quik Trip (QT) is a top-tier chain of convenience stores and gas stations that operate in the South, Midwest, and the Southeast United States as well as in Arizona. My assignment was to work with QT in evaluating the company’s prospects for getting into the car wash business. At that time, QT was retooling its Gen 2 store design to accommodate a larger convenience store with food services along with more multiple-product fuel dispensers. Since the company planned to beta test two of its existing properties for an included car wash, part of my assignment was to evaluate the market and existing car wash fleet. Back then, professional car washing in Tulsa could be described as behind the times and included a couple of conveyors, a few in-bay automatics at gas sites, while self-service predominated. Here, many of the self-serve properties are larger combination facilities with eight or 10 wand-bays and a single or dual in-bay automatic. Since then, things have changed considerably. Quik Trip has grown from 500 to over 750 stores, the company dumped the car wash idea, and Tulsa has seen a wave of new car wash development. According to a recent survey, there are now at least 10 express washes where once there were none, which brings the total size of the fleet in the study area to over 25 units plus a number of washes on the periphery. For those unfamiliar with the geography, Tulsa is located in the northeastern corner of Oklahoma, about 100 miles northeast of Oklahoma City and situated between the edge of the Great Plains and the foothills of the Ozarks in a generally forested region of rolling hills. The city is surrounded by an inner-dispersal loop created by Interstate 244, Highway 64, and Highway 75. Suburban communities predominate. Tulsa’s economy has roots in the oil and natural gas industries, and the city is home to the headquarters of many international oil- and gas-related companies. However, Tulsa’s primary employers are mostly small- and medium-sized businesses, which make up more than 80 percent of the city’s companies. 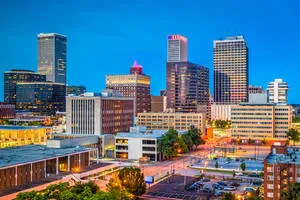 Tulsa is also something of a college town with 15 institutions of higher education including two private universities: the University of Tulsa, and Oral Roberts University. In terms of demography, Tulsa is mostly plain vanilla. For example, the area has a population density of 2,000 people per square mile, but growth in population and labor force has been nominal. Tulsa is racially mixed and, since my initial evaluation, the Hispanic percentage of the population has doubled and is expected to increase going forward. Per capita income is on par with the U.S. average, but not home ownership at 50 percent, or car ownership at 1.7 per household. Although these characteristics are not sterling, the market range for the car wash fleet in Tulsa contains hundreds of thousands of people, which makes for a strong market. Arguably, it has been the size of the market and the nature of competition that has driven the wholesale change in the car wash industry within the Tulsa trading area. Once underserved, Tulsa now has a fleet of express washes including units from two branded chains: Zips and Legends. How many more car wash units the region can support is debatable. For example, there are still over 60 wand-bays and 15 in-bay automatics at self-service sites to pummel. Moreover, since QT owns over 65 percent of the convenience stores and gas stations in Tulsa, and it doesn’t have any car washes, there is practically no competition from this sector. Consequently, our rough calculations suggest the region can still support more new stores. In the final analysis, Tulsa is similar to many other metropolitan areas that we have had the opportunity to go back to and reexamine. Even here in Pinellas County, FL, long a bastion of ancient full-service tunnels and touch-less in-bay automatics at gas sites, a gentrification of the car wash fleet is underway. It began some years ago with acquisitions by Mister Car Wash, which converted one of its holdings into the county’s first express exterior. And then, slowly but surely, developers began to build new modern washes, the most recent of which are two NASCAR-branded express washes.